Sometimes when you go out on location to photograph, things don’t go as you had planned. Often because of the weather, which can change even as you on are your way there. This past spring I was doing a shoot at a local golf course. The management scheduled me to come on a day when the course was closed. Actually, this worked better for me since I did not have to be concerned with interrupting a club member’s golf game. Plus I had free access of the entire property. 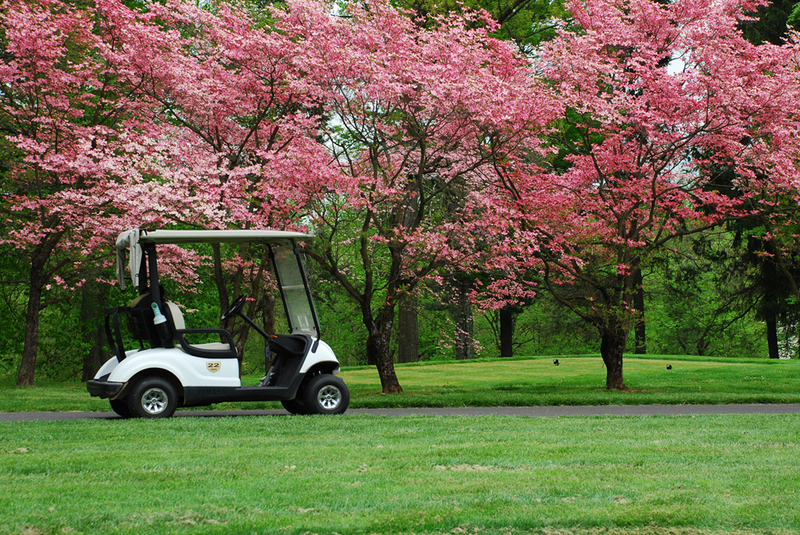 I was looking forward shooting all the spring flowers in bloom, with the fairways and greens lush with their new growth. But, as luck would have it, that day the sun was behind heavy cloud cover, eliminating the blue skies I had been hoping for. Rather than photographing expansive shots of the fairways, greens and dull grey skies, I decided to find smaller, less obvious subjects on the property. Since overcast skies will tend to make the light even and lessen harsh shadows, I chose to photograph interesting parts of the restored mansion-turned-clubhouse and the surrounding gardens. I was also able to get in close and shoot the flowering Dogwoods with a nice backdrop of fir trees, rather than the traditional fairway shot with little tiny trees in the background. Fountains of water from sprinklers spraying the greens made interesting patterns and shapes. I also got some shots of the greens surrounded on three sides by large trees that did not include the lifeless sky. I was able to schedule a second visit to the golf club on another day that had beautiful blue skies, while everything was still blooming. So, I got the shots I needed. But you don’t always have the luxury of being able to go back to the same location on a nicer day. Especially if you have a long distance to travel, or you are on vacation with a limited timeframe. So, when mother nature throws you a curve ball, don’t throw in the towel. Look around and make the best of the situation. And I bet you will be pleasantly surprised at the outcome. Do you have the photography blahs? A bad case of the “I dunno what I wanna shoot today?” Need some inspiration? Here is one idea that I use when I get a bad case of the “I-dunnos”. Write down five different colors on separate pieces of paper and put them in a box, a paper bag or something that you can’t peek through. Choose one and go out and shoot that color. Fill a data card with photos. After all, we are shooting digital and you can always delete what doesn’t work. Let’s say you pick the color red. Shoot red flowers, or firetrucks or old barns. Even close-ups of clothing or parts of things that have red in them can make great subjects. Patterns with red can be fun and can take on an abstract feel. Get close up to isolate red things on different color backgrounds. Shoot red things in shadow or bright light. Shoot things that only have a small amount of red or things that are all red. And don’t forget to shoot different shades of red too. You will be amazed at what you will find…then go try a different color the next day! The abstract image featured in this post is one I recently shot. 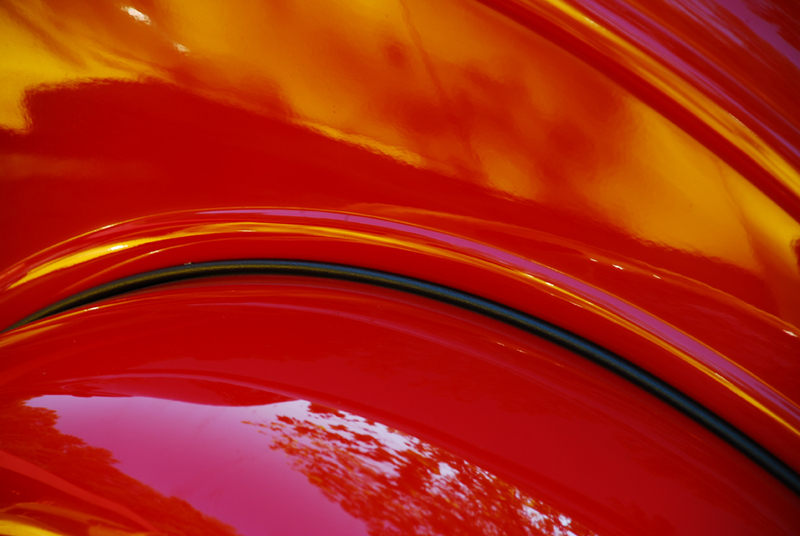 It is a close-up the rear fender of a restored classic car I came across in my travels that day. I loved the curves, leading lines and reflections that I was able to capture. Of all the red images I took that day, this is the one I liked the best. In this Back To Basics series, I would like to start at the beginning with how to hold your camera when taking a photograph. It seems simple enough, I know. But if you do not support your camera correctly, you run the risk of camera shake. This can cause fuzzy and out of focus photographs. So why frustrate yourself? Holding a camera properly is easy to do and will become second nature in no time. The right hand should be positioned so that the grip is held by the last 3 fingers, and your forefinger is on the shutter release. Your left hand should be positioned palm facing up, to cradle the lens and/or bottom of the camera body. No extended pinkies here…we are not having high tea in a fancy restaurant. Besides, you wouldn’t want your fingers in the photograph. When you position your hands this way, you tend to tuck your elbows in, making your body and camera one unit. When you look through the viewfinder in this position, there is less chance for camera shake which equals sharper photographs. There are cameras with live view monitors on the back of the camera that allow you to compose and take photographs looking at the monitor, rather than through the viewfinder. This can be very handy in some instances. But it has been my experience that holding my arms out in front of me doesn’t work so well. First, gravity shows itself, then the excitement of getting that shot comes into play, or maybe you are in a crowd of people and someone bumps into you. You’re gonna get a fuzzy photograph. I am not saying this is the only correct way to support your camera. For instance, Joe McNally has developed his own style of holding his equipment. And it works for him. Check out his video link at the bottom of this post. Even if his method does not work for you, you should get a kick out of the video. I know I did. There is a lot of technology built into cameras today. Even if you have a vibration reduction system in your camera, it can only do so much. It is still up to you as the photographer behind the lens to capture the best image you can. Getting in the habit of holding your camera correctly will increase your odds of clear, crisp images.